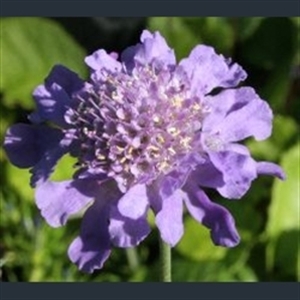 Scabiosa japonica var. alpina is a perennial, whereas the straight species is biennial. 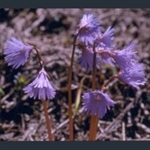 It produces blue flowerheads with ray-like outer florets. The pinnate basal leaves have deeply toothed lobes. Dark maroon fleshy leaves with flat heads of dark pink flowers. Yellow flowers with a white eye, over mealy foliage. Slender spikes of white flowers over round leaves, bright red at some seasons.